HONOLULU- The Honolulu Museum of Art, Honolulu Museum of Art School Mezzanine Gallery will feature the collaborative work of James Jack and Toshiaki Tomita in the exhibition Solvitur Ambulando. This exhibition has been made possible by collaboration with curator Marion Cadora and features diverse media including water, audio recordings and images that have been collected during walk events held on both sides of the Pacific over the past twelve months. In the intermediary city of Honolulu counterparts from both sides of the Pacific will intersect to form a significant dialogue that cherishes our relationship with the land underneath our feet. This project Solvitur Ambulando (“solve it by walking”) is composed of stories, questions and dialogues occurring in our time of uncertainty. It is part of a creative search for new relationships to land given the realities of our situation after the 3.11 disaster in Tohoku. If the disaster is not limited to Japan, then folklorist Norio Akasaka’s discussion may be true, 3.11 has pulled a reality from a few decades ahead. If so, it may not be possible to fix this, rather we must stretch and extend our minds to grasp it. Tomita and Jack see these difficult circumstances as the impetus to take imaginative walks that explore new visions of reality. For the exhibit at the Honolulu Museum of Art the artists will create a mind map for a future walk event specifically for Hawai‘i. This will be created through various participatory elements such as the changing installation Story Circle as well as Wall of Ocean Currents participatory works that will be composed by visitors during the exhibition. The artists will also exchange a drawing back and forth during the exhibition period to be displayed before the closing. Together with ephemera from past walks these generative elements will compose a metaphorical “walk across the pacific” in real time at the Honolulu Museum of Art School. Jack and Tomita have created open structures through the practice of walking and talking. In her introduction to the exhibition curator Marion Cadora writes, “Is the wider Pacific Ocean a boundless space—inviting anyone to navigate it freely, its definition open to negotiation? Or is it a fragmented entity; isolated by its own terrain, privatized bodies of water, and imagined territories? 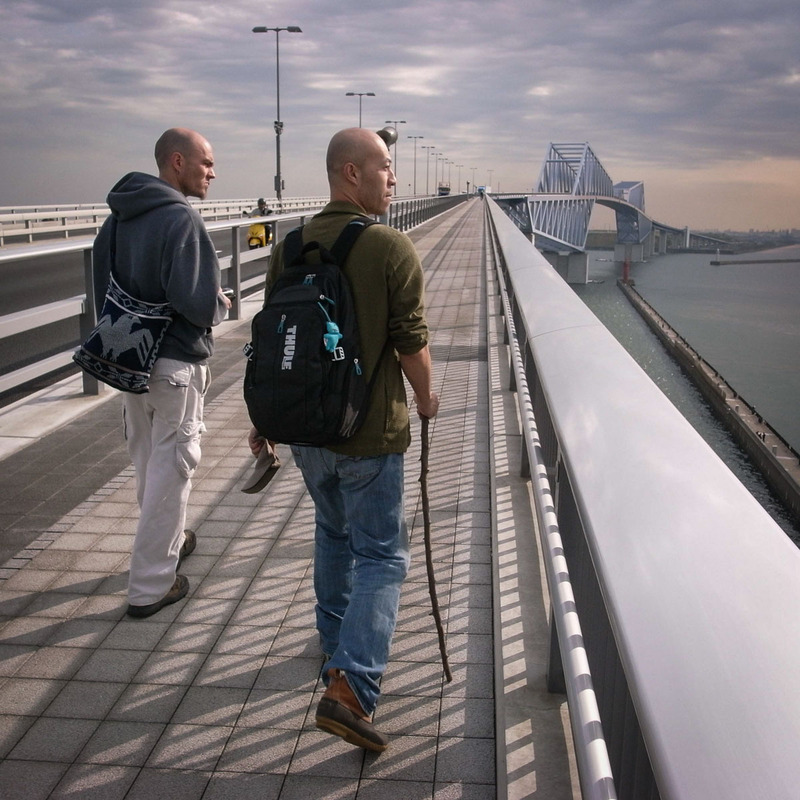 It is unknown until we make the journey ourselves.” Based on walks that have occurred in Tokyo Bay as well as for the Open Engagement conference held in Portland, Oregon the artists have continued walking at a distance, feeling the links between one island and another. This exhibit will also include special developments that occur during this exhibition to facilitate the creative foundations for a walk to be held in Honolulu. Artists Jack and Tomita are engaged with conversation as their medium and have received numerous awards and acclaim for their artworks and publications. The two artists have been collaborating on projects since 2010 such as Living in Story and Storied Landscape and began their current project in 2012. James Jack explores the social composition of land in through layers that compose his artworks. This year his work has been featured at the Setouchi International Triennial in Japan, Institute of Contemporary Arts in Singapore and the Busan Biennale Sea Art Festival in Korea. He is currently pursuing research and teaching in the painting department at Tokyo University of the Arts. Toshiaki Tomita creates artworks that are a story about the process of becoming intimate with images. His work has been exhibited at the Seoul Arts Center in Korea, Yokohama Triennial in Japan and the Odense City Museum in Denmark. He is currently an Assistant Professor of Art at Hokkaido University of Education. Marion Cadora has worked at the De Young Museum and the Asian Art Museum in San Francisco as well as the John Charlot Collection and the Intersections Visiting Artist Program at the University of Hawai‘i at Mānoa. She is currently Assistant Curator at the John Young Museum of Art in Honolulu. A special musical event held during the last weekend of the Setouchi Triennial exhibition at Sunset House: Language as the house of Being featuring Ryu Furusawa, Akira Tanabe, Makoto Noumi and Bruce Huebner. This event was a celebration of all those who have supported the exhibition over the past six months as well as signal of what is to come in the future for this art project. Sound artist Ryu Furusawa recording the sound of two basalt stones clicking against each other in preparation for his live performance “silent scene” at Sunset House. 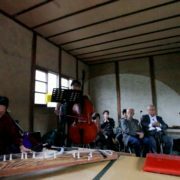 His sound piece included sounds of the Setouchi ocean as well as other local recordings made on Shodoshima specially for this event. 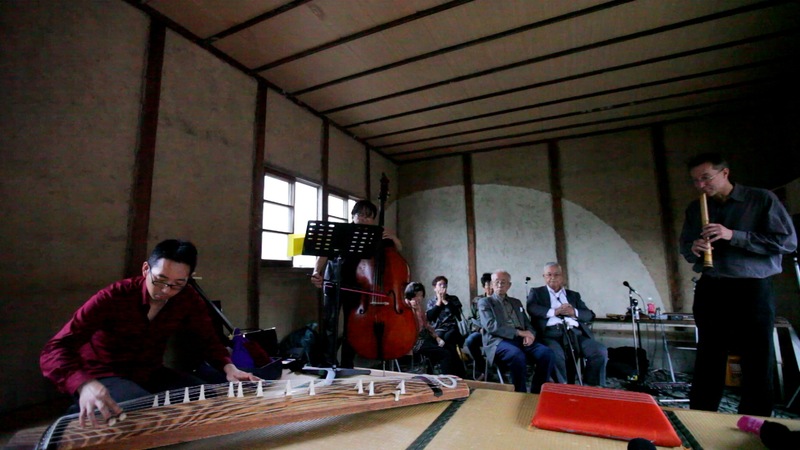 (From left) Akira Tanabe, Makoto Noumi and Bruce Huebner perform the song “Haru no umi” at the conclusion of the musical gathering to an audience that overflowed into the entrance, garden and surrounding environment of Sunset House. An article on the background context for this art project by Darryl Jingwen Wee was published on artinfo (link HERE) as well as a slideshow posted (link HERE) today. The existence of this house of being has blossomed into a wider community than ever with the unique energy of this musical event generously sponsored by the American Embassy in Tokyo.